At 28 years of age, Anna was hospitalised under a forensic order, which marked the start of a decade-long journey of repeated drug use, mental health issues and revolving door admissions to hospital and jail. Even when in hospital care, Anna would abscond and then turn to drugs, making her unwell and psychotic, which only drew her to the attention of the police. During this time, Anna had over 30 legal charges laid against her and all five of her children were placed in State care. Anna had no accommodation options available to her, no community connection or supports, and had minimal insight into her own mental health issues. There were significant concerns regarding Anna’s safety to herself and others when using drugs and in the community. This culminated with a subsequent referral to high security locked ward in Brisbane which imposed strict leave restrictions. There was a significant need for care coordination to assist in finding a solution in everyone’s best interest. It was at this point that Anna was connected with Partners In Recovery, and she felt she finally found hope. PIR assisted Anna to link with voluntary, community supports and weekly case reviews to develop a shared purpose, based on Anna’s wants, needs and goals. As a team – which included Anna – all stakeholders worked together to develop creative solutions, and tried new ideas and strategies to reach Anna’s goals. 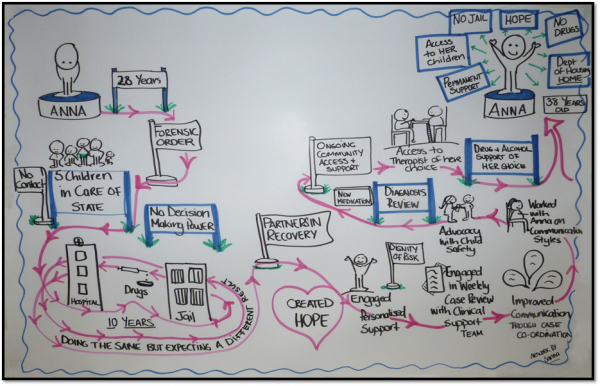 PIR worked alongside Anna to make application to secure community supports (Housing and Support Package – HASP). PIR supported her in building communication skills and strategies through role modelling and providing feedback to allow Anna learning opportunities to ensure better outcomes for herself. Anna is now 38 years old, is drug-free and no longer faces the prospect of time in jail. Anna has a place to call home, and most importantly, has access to her children. Anna now feels she has permanent support in place, and this has enabled her to feel hope for the first time in her life. Anna’s goal is to live independently with her kids in the community, own a car, and find her perfect job. With PIR’s support and her own tenacity, Anna is on her way to achieving these.